Archery has a huge tradition in combat, hunting and sport, with special, historic ties to Great Britain. It began life as a form of military weapon, and was used by armies and warriors around the world, notably by American Indians, the Chinese, and the English, famed for their longbows. Pellpax is a major UK vendor of crossbows, bows and archery equipment which we have for sale, and we’re lucky to have experts on hand to help, too. We’re passionate about the subject, so we’d like to present for you here a quick guide to everything you need to know about Archery. There is evidence of archery and bows being used as far back as 3000BC here in Great Britain, but it was after the defeat of the English in 1066 that successive kings worked to ensure that there was a steady supply of skilled archers amongst the ranks of our armies. During different periods kings even went as far as to ban sports such as football, bowls, and in Scotland, golf. The development of firearms lead to the gradual cessation of archery as a military necessity, but it was then revived as early as the 16th century for sport and competition. One of the earliest groups to do this was the Society of Archers at Scorton, formed in 1673. They run a competition with a prize known as the Antient Silver Arrow, which runs up to this very day. Other societies and groups like the Toxophilite Society, 1781, and 1787 by the Royal British Bowmen, followed. The Grand National Archery Society, which is today known as the Archery GB, and is the governing body for archery in the United Kingdom, was formed at Liverpool in 1861. There are several different types of bow. Here are just some of them, below. Compound bow: This kind of bow has mechanical additions, such as pulleys, which assist the drawing of the bow. Usually, these aids are pulleys at the tips of the limbs. Crossbow: A crossbow is a gun-like weapon where the limbs of the bow are at right angles to a stock, which carries a ‘bolt’, rather than an arrow. You can grab yourself a crossbow for sale from our huge range. Longbow: A bow made from one piece of wood, which has limbs that are rounded, and is around the height of the archer, thereby allowing a draw of over 5 feet (1 and a half metres). Often made of yew wood. Recurve bow: This is a bow that has the end of each limb curving in an away direction from the person holding it. What happens is that the curves become straight as the archer draws the bow, and the tips go back to their original, curved state after the arrow has been fired. This adds extra speed to the arrow. Reflex bow: In this type of bow, the whole of each limb is curved away from the archer. You can find your local archery club by using the Archery GB Club Finder here. There are a wide range of courses run up and down the country at different clubs. You can find details with you local club, and online at resources like Archery GB. These include Personal Performance Courses, which are improver courses, which are for people who have been in the sport for at least 6 months and have their own equipment. 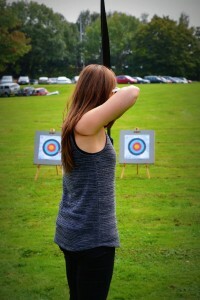 Organisations like 2020 Archery in London offer Beginner Courses, and longer, 5 Week Courses. It is organised in association with Sports Structures Ltd. Full details here. You can also get to Level 1, Level 2, and County Coach and Senior Coach levels with Archery GB. Full details at their website. You can check our our huge range and grab yourself one of our range of crossbows for sale, compound bows, recurve bows and archery accessories to buy, right here at Pellpax, and we deliver across the UK.